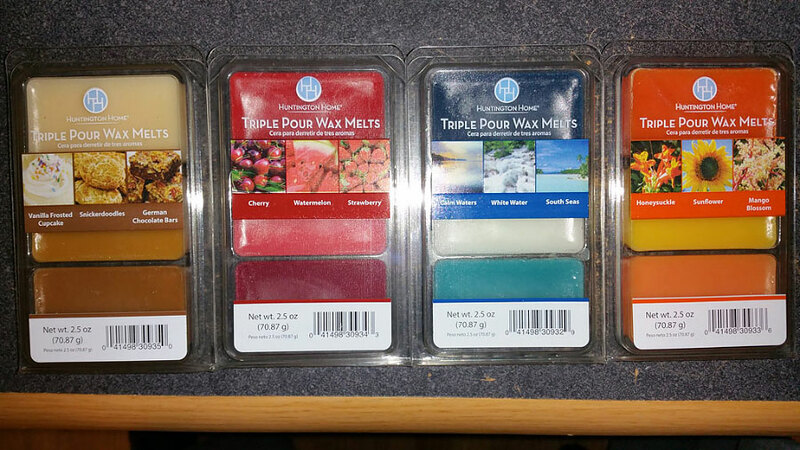 Read Aldi Wax Melt Reviews from Summer 2018 (Huntington Home brand). The Aldi summer scents are always triple melts (each pack has three scents in it instead of one), like the old Mainstays triple melts from Walmart. The video for this review is in our Facebook Group (not on YouTube). If you're not already a member of the group, you'll be able to join from that link. This is just a standard sweet vanilla scent. It's the same as the Vanilla Frosted Cupcake scent from Hanna's Candle (not confirmed by Hanna's Candle). A yummy super sweet caramel scent with just a hint of buttery salted caramel. I don't detect cinnamon at all. A rich milky light chocolate scent (not a burnt chocolate). I believe this is the same scent as the Jolly Rancher Cherry scent from Hanna's Candle (not confirmed by Hanna's Candle). It smells like vinyl with a hint of a fake cherry note. Although it's kind of sweet, it's not sweet or candy-ish enough. It's not even authentic or sweet enough to smell like cherry cough syrup, as a lot of fake cherry scents do. I don't care for this one. This is a nice sweet almost candy-like watermelon scent. It's summery and thirst quenching and almost has a tiny bit of a floral note. It's the same scent as Watermelon Sorbet, Jolly Rancher Watermelon, and Watermelon Lemonade, all from Hanna's Candle (not confirmed by Hanna's Candle). A nice strawberry scent. It's not authentic (which is okay), and has a smidgen of a sour note. It's not the same scent as Hanna's Sweet Strawberry Preserves (not nearly as sweet). Notes: Aquatic notes of water lily and an ozone accord swirl with violet leaves for brightness and clarity. Tender muguet, rose and freesia petals float in the heart with softness and serenity. The warmth of sun-kissed driftwood blends with transparent musk and white amber for enveloping comfort. This is the same scent as the old Mainstays Peaceful Waters scent from Walmart. It's a little similar to the Aldi South Seas scent from January 2018, and Tuscany Rain, but it's not the same scent. It's the same Peaceful Waters scent from the Aldi blue trio from April 2016. Peaceful Waters is a sweet watery scent that's different from any other wax melts I've smelled. There's a strong note that is in the forefront, but I can't figure out what it is. Maybe a combination of musk, floral and vanilla? Looking at the scent notes for Mainstays Peaceful Waters, it's quite a complex scent. This is the same scent as the Aldi Fresh Cotton Blossom scent from January 2018. It's a fantastic sweet laundry detergent scent with a little bit of a biting laundry note, but not as much as Better Homes & Gardens Line Dried Linen. And it's not a soft powdery fabric softener scent either. It doesn't smell soapy, and it's sweeter than other similar scents I've smelled, with a little bit more of a floral note, although it's not really perfumey either. Hard to describe! It's NOT the same scent as Hanna's Candle Fresh Cotton Blossom scent. Like in January, the scent lasted the entire day, but I let it go for 2 days and it was still quite strong! A super fresh, clean watery scent that smells a little pool chlorine (but in a good way). It's not a body wash or cologney type scent at all. And it's not the same as the Aldi South Seas scent from Spring 2018. One of my favorite scents, this is very sweet and has an orange blossom note. Fantastic. It's the same scent as all the honeysuckle scents from Hanna's Candle (not confirmed by Hanna's Candle). This is the same as Sparkling Citrus Zest and Lime Lemonade, both from Hanna's Candle (not confirmed by Hanna's Candle). It's not a floral scent at all, but it smells fantastic, like orange soda but without the fizziness. There may be a hint of floral, because it's not an overly citrusy orange. This is definitely a mango scent. Mango scents smell like peach but have a slightly sour tropical note. This one does have that sour note that gives it a very slight cat pee vibe, but it's still a nice scent. I'll bet it would smell great mixed with the Honeysuckle in this trio.